As a company we have built a fantastic reputation based on years of fantastic customer service. As an ISO 9001:2008 accredited company, Gate Safe Aware Installers and members of the Door & Hardware Federation Powered Gate Group, Frontline Automation ensures that all work is carried out to the most stringent quality and safety standards. We regularly update our processes to ensure the best possible service is provided at all times, both on site and within the office. Every metal gate we install is designed and manufactured in-house, allowing us complete control over the design, automation and access requirements. We will project manage the installation from start to finish, incorporating design and security requirements, all the while ensuring that any legal safety obligations are met. You will have a designated point of contact within Frontline Automation who will keep you regularly updated and be available to answer any queries you have. 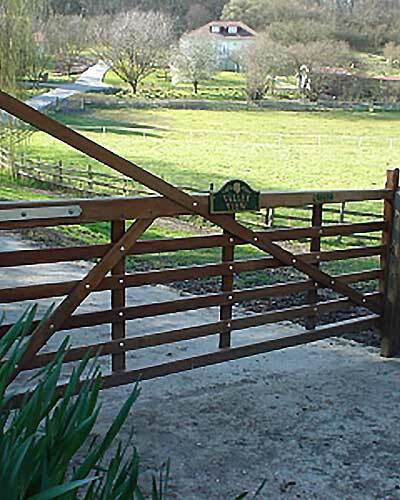 We also install and automate wooden gates and have long-standing relationships with a number of local joiners/carpenters – Together we will consult with you to ensure we obtain the perfect end product. We offer a huge range of automation and access options and our skilled sales staff receive regular training to ensure they can answer all of your queries. We have installed and maintained systems for a number of high-profile clients over the years, including the BBC, BT, Southern Water, South East Water, Network Rail, Metropolitan Police, Bunn Leisure and various Central London Shopping Centres. Of particular interest to a number of our larger commercial clients is our Cantilever Gate Design, a product we have worked at and perfected over the years to offer the ultimate security solution. The ease of installation and high level of security adds to their popularity- because our cantilever gate is essentially a bespoke product based on established design features, we are also able to offer a less industrial/heavy duty option to our residential customers. As Gate Safe Aware Installers, we are committed to ensuring that all automated gates systems installed or worked on by ourselves are to the highest gate safety standards. Whether it is a new install or adaptions being made to an existing system, our fully trained staff can confidently advise you on your/our obligations under gate safety legislation. There will usually be a number of solutions available, allowing you to have a safe and compliant system, all the while maintaining high levels of security and being aesthetically pleasing. Not only do we design and install, we also offer tailor made after sales maintenance contracts, both on new installations, and also on existing systems, whether they were installed by us or an alternative company. Once the system has been assessed for safety compliance, we will discuss the level of use and site requirements and provide a no-obligation quotation. As standard, residential customers will be offered a maintenance contract with a minimum of 1 annual service visit, whereas commercial or multi user premises will require a minimum of 2 visits by law, and in some cases we would recommend more depending on the volume of traffic. All of our maintenance contracts will include at least one annual safety impact test to keep your system in line with gate safety legislation. Following the impact test, you will be provided with a copy of the report along with any observations/recommendations. We also offer our clients a 24/7 breakdown service, and if you hold one of our maintenance agreements you will automatically be granted access to our 24/7 call-out service. We also offer additional response times of 24,12 or 4 hours, meaning that we could guarantee to be with you within as little as 4 hours, 24 hours a day, 365 days a year. At Frontline Automation, we believe there is no job too large or too small. From a replacement transmitter or single call-out for a residential customer to a complete security overhaul and maintenance package for a large commercial site, we pride ourselves on offering unfalteringly excellent customer service. The Gate Automation Industry is competitive, and we pride ourselves on being able to provide security solutions to suit almost all budgets and applications. We offer free site surveys and no obligation quotations to all of our customers, residential of commercial. Please contact us* to arrange.